For a number of years I have thought about getting a bike again. As a child I had a big wheel and loved it. I rode it so much it literally fell apart one day. Since then I have not had a bike and have often wanted one. Over the years I looked into it and found it to be expensive and complicated which often lead me to find something else to do with my time. Well about two weeks ago I started looking into bikes again and came across new information and possibilities. 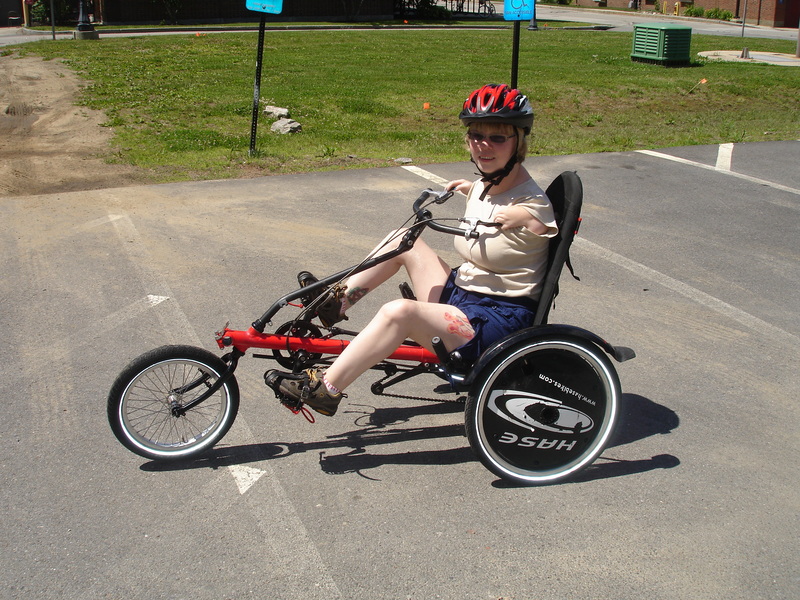 On Friday I went to NH to a program called Northeast Passage to have a bike demo. I was going to be able to try various bikes and see which would really work for me. Very exciting. I received more out of the appointment then I had imagined. When I first arrived I was brought into a huge room of bikes. I got to look through them and see what would work we settled on two possibilities. A trike bike and the banana peel bike. The trike bike we had to play with for a while to get things set at the right measurements. This had hand brakes and the steering were with my hands which I found to be difficult once they had me riding it. Then we switched to the banana peel bike. 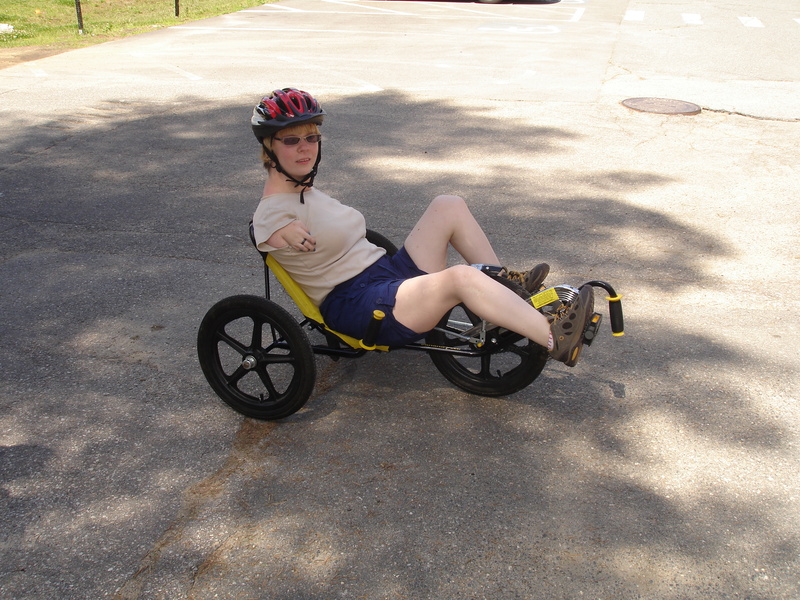 This bike was amazing it was so easy to use the steering and peddling were controlled by the hips and legs. It felt so natural. I rode around the parking for a while and found that I was getting good at it pretty quick. The main drawback to this bike is that it is only a one speed. So if I really got into riding I may need something with more speed. I had a lot of fun and got amazing information. I found that I could sign up with Spaulding Hospital to be involved with their adaptive cycling program and use the same banana peel bike. This would give be a chance to really try this bike out before buying it. Then I learned about other adaptive sports that Northeast Passage was involved with water-skiing, kayaking, golf, and shooting. I’m very exciting about all these possibilities for this summer. I am already signed up for cycling and water-skiing. I’m looking into kayaking and shooting. I love to try new thing!